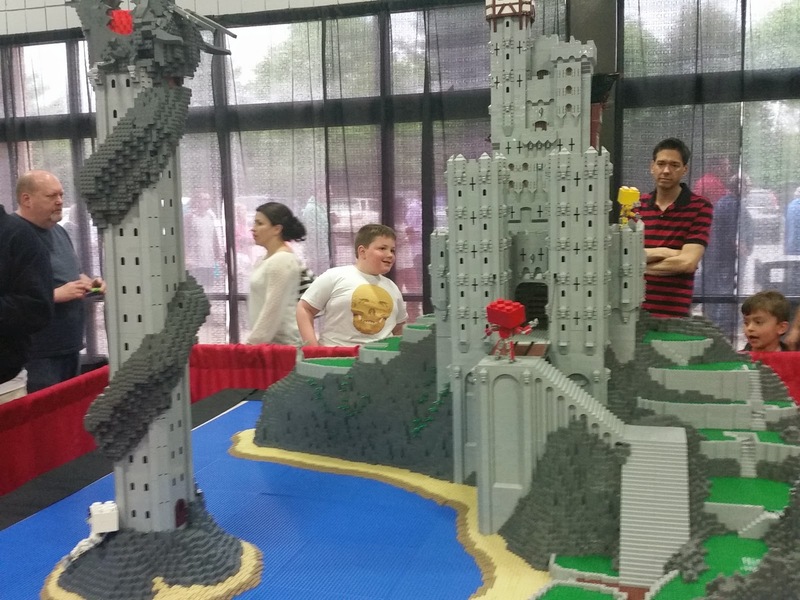 So, this weekend in Marlborough, MA is BrickFest Live, a conference/event held for fans of LEGO bricks. This is not a LEGO sponsored event as the hosts have no affiliation with the company except being big fans. Sunday is the last day of the event, and there are two sessions left: 9-1, and 3-7. 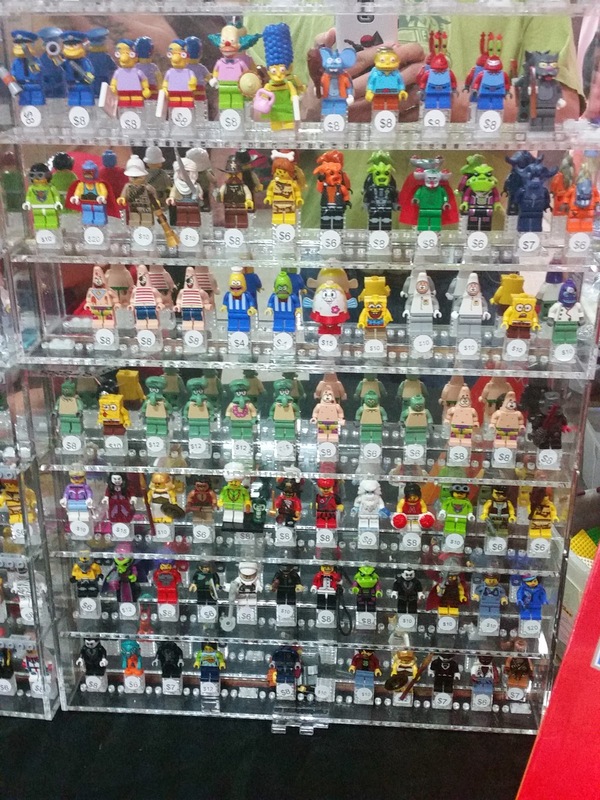 You can still get BrickFest Live tickets for $22 each. Under age 2 is free. We went to the Saturday session, from 3-7. We arrived just after 3 o'clock and boy was that a mistake. The line to get inside was out the building, down the street, over a fence, around the corner, and all the way back to the Best Western parking lot. I waited online while everyone else in our group waited near the front, and for me to get through the line. It took close to twenty minutes to get inside. Once inside, you see many large scale Lego models like the one above. More prevalent at the fair is all the vendors. 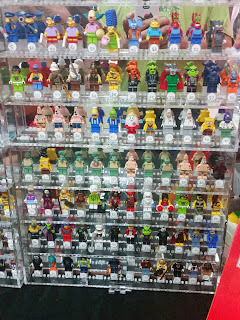 You can buy any figurine you wanted, for instance, all nicely organized. I compared the prices to those on eBay and the festival had better prices (and no shipping charges). We bought a Harry Potter figurine, my son's latest obsession. The room to the far right was full of activities, mostly for the younger kids, though certainly not only for them. This includes a swimming pool full of red bricks to build anything you want, miniature golf where each hole is made out of LEGO. The rest of the festival is vendor upon vendor upon vendor. One observation... 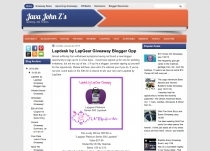 Many of the people attending already knew the different vendors. 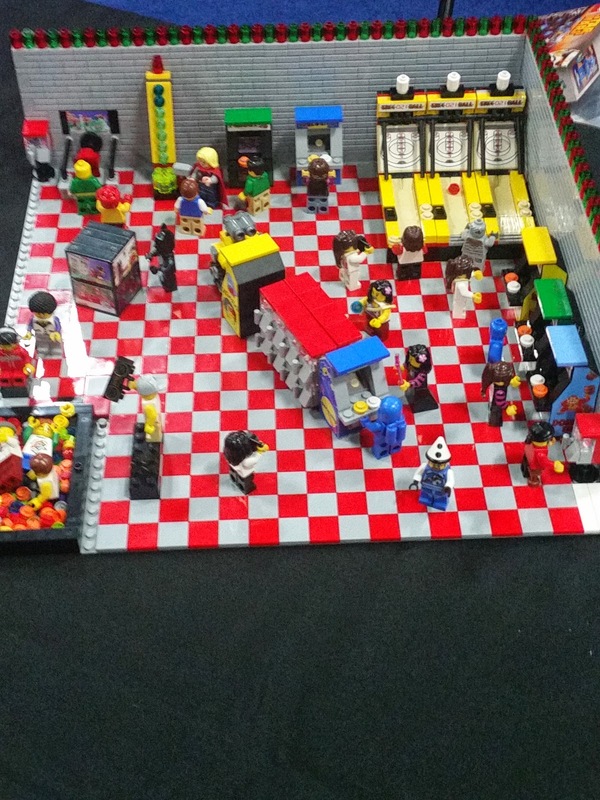 Some vendors combined their creations into things like the LEGO arcade above. About the only thing we couldn't find were complete Harry Potter sets. They seem to be in high demand these days. The concession stand was actually cheaper than I expected. 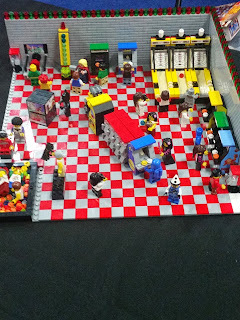 A bottle of water and an overly salty pretzel cost just about $9 at the last LEGO festival we went to. Here, under $5. Overall, a fun show that really hyped up my son and he probably drove a vendor nuts, asking who each of the figurines were in the Harry Potter sets. Be prepared to spend lots of money, from the $22 tickets each to the different vendor offerings. It will be fun no matter what.